A blog entry here two and a half years ago (January 2016) discussed a phase I was in of reading Marilynn Robinson books. 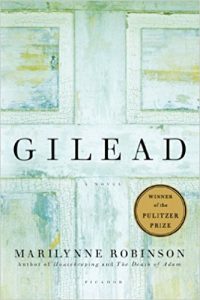 The phase is currently being revisited because my reading buddy, Linda, and I have taken up Gilead—we’re both reading it and will spend some time talking about it. Robinson’s gift as an author is not plot, nor setting, nor pacing, but rather characterization. Her key characters are deeply drawn to the extent that they become unforgettable. This is true mostly of the characters who actually appear on the page as part of the story (the pastor John Ames and his wife, Lila, for example), but also of a few who appear only in the memories of the key players. Through John Ames’s memories, we come to know his grandfather pretty well, a difficult man long gone from the world but one who left his mark on his family and his church. No matter how dire a situation the old man faced—including the loss of an eye in wartime—he was inclined to remark: “I am confident that I will find great blessing in it.” How can you not love a character who makes such a statement his approach to life?